My father taught me how to cook. It was simple enough; one day when I was 5 he announced that we were going to make omelets. Sounded good to me. I had always been an inquisitive child and I enjoyed learning new things. Little did I know at the time that this scene was a repeat of one that had unfolded almost twenty years before. My father was taught how to cook by his French “bonne a tout faire”, which roughly translates as “woman who-does-everything” and Marie-Therese did it all. It was 1948 and my father, Moses Acosta, was living on rue de Lessepps in the very close outskirts of Paris. It was post war and he and his wife, Elise, had rented a beautiful stone house with a one-acre yard. Marie-Therese had grown up in Provence where her parents owned an auberge and she had learned her way around the inn’s kitchen at a very early age. Marie-Therese’s job at rue de Lessepps was to shop, clean and cook and she ran a tight ship. Elise would come into the kitchen and start asking questions – what did you buy? What are you making for dinner? When will it be ready? That sort of thing. Very early on, Marie-Therese established her boundaries. One day she removed her apron in dramatic protest and told Elise that if she were not left alone in the kitchen without interruption, she would not cook. Elise, to her credit, knew she had a good thing going, so she agreed to remain scarce. Now my father on the other hand, took his chances. One day he was sitting at the kitchen table while Marie-Therese was in the midst of preparing boeuf bourguignon for dinner. He made sure to be as unobtrusive as possible, reading his paper and combing through mail. Eventually he spoke up and asked if he could help. With a somewhat bemused tone Marie-Therese asked him what did he possibly think he could help with? How about peeling carrots, he suggested. As this was not going to ruin the meal, she agreed. My father took a paring knife and proceeded to actually peel the carrot, as one would peel an apple, digging into the surface of the vegetable. With Marie-Therese looking on with amusement he whittled the first carrot down by at least thirty percent. “Monsieur”, she said, “comme ca – like this.” She took a new carrot and showed him how to scrape off the very outer layer with the edge of the knife. His eyes lit up and he followed suit. From then on, he was invited into her kitchen to help – and learn. One Saturday Elise was to be gone all day. After weeks of chopping vegetables, Marie-Therese had a plan. 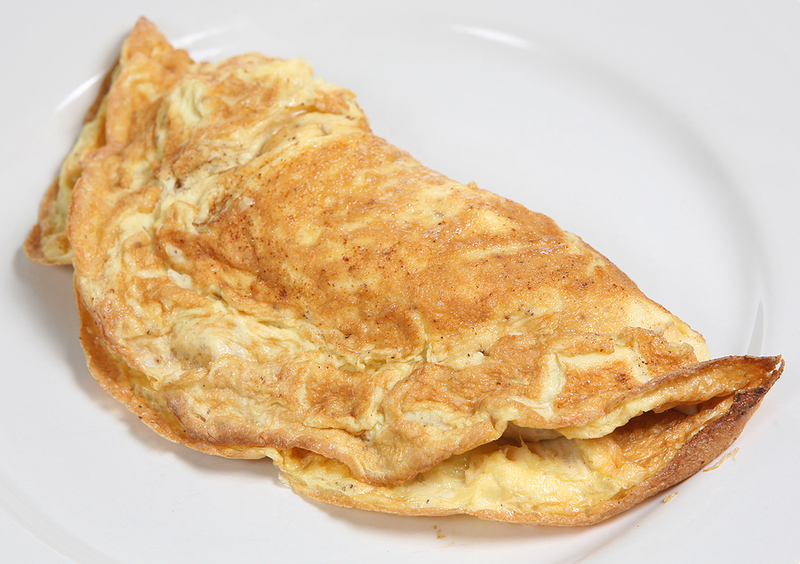 It was time to teach my father how to make a simple, classic French dish – an omelet. She went to the market and came home with two-dozen eggs. My father watched as she prepared her mise en place. The eggs were broken into a large crockery bowl and beaten – just enough. Onions were sautéed, mushrooms sliced, herbs picked from their stems, cheese grated and bits of ham were julienned. “First,” she announced, “we will make omelet de jambon.” She placed butter in a small pan with sloping sides, melted it over medium heat and ladled in some of the beaten eggs. Just as the eggs began to set, she scattered some pieces of ham in the center, folded it in half and placed it on a plate. “Voila, monsieur, omelet de jambon.” She seasoned it with a bit of salt and pepper. “May I try it,” he asked? “No, not yet,” she admonished. He watched as she took three additional strips of ham and gently laid them over the top on the diagonal, instantly indicating that this was an omelet of the porcine persuasion. “Now it is ready,” she declared. He tasted the omelet. So simple and yet so refined. The amalgam of basic ingredients far surpassed the individual parts. He was beginning to sense the possibilities of the kitchen. “Now you do it,” she directed him. He followed her steps, one by one, each one flowing into the next, each one building on the last. It made sense. The progression was logical and the process was easy for him. Together they made about eight omelets, many embellished on the top, as with the first, with a bit of their filling. She had him perform the task, then she would give constructive criticism where needed. One was perfect. Another was a bit overdone – could he see how the eggs had begun to toughen? Again, she talked him through it, this time, encasing tiny squares of crisp bread croutons in the center of the omelet. My father attempted to balance a few croutons on the top of the plated dish. “Pas comme ca,” she scolded, “not like that!” Apparently this one was to be served au natural. From then on he was treated to her vast, seemingly innate, culinary knowledge. The alchemy of simple honest ingredients combined with basic techniques opened up a world to him of homemade, deeply satisfying food. So back to our kitchen on 10th street in New York City. It is 1966 and my father repeated the lesson, with me standing on a chair to reach the stove. We too made several omelets, including his now famous “omelet au crouton”, which he had, in fact, introduced to a few French chefs here in the states, much to their delight. Omelet preparation became “my thing” and I enjoyed practicing as often as possible. One day a fellow Kindergartener came for a sleepover. My father noticed that during the evening I went to the refrigerator, removed a piece of Gruyere, and placed it on the counter. “Why are you leaving the cheese out,” he inquired? Now, imagine that this story has been told a hundred times and as it has never wavered – and as I cannot actually remember the scene myself – I choose to believe that my father’s rendition is the truth. Looking back, my father says, right then and there he should have realized that food would figure into my future.